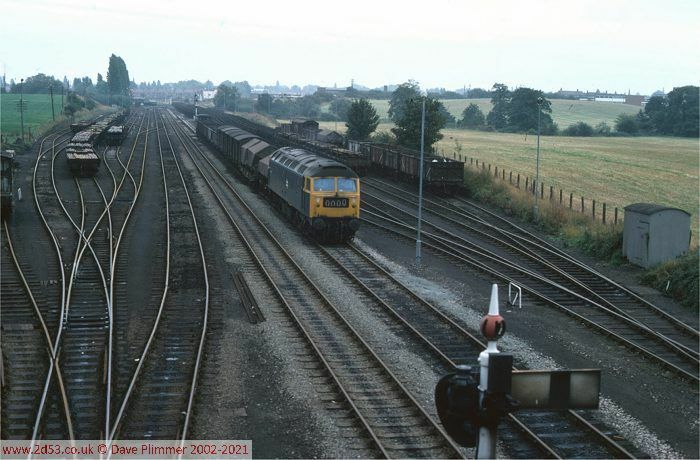 Freight activity at Wrexham was centred on Croes Newydd yard, which lay south of the stations, and on a branch at right-angles to the main-line. The branch continued to Brymbo steelworks, which provided much of the traffic for the yard. Lower down the page you will find arrivals and departures for 1976 and 1982. The decline in workings between these two years is dramatic, but worse was to come and the yard closed completely from 30th October 1982. Croes Newydd Yard was formed of two groups of sidings on either side of the Brymbo branch. Part way down, the sidings narrowed where Croesnewydd Road bridge crossed over. This shot was taken from this point, looking towards Croes Newydd East in the distance where the lines forked to make a triangular lunction with the main line. On the other side of this bridge, the lines continued to Croes Newydd West signal box and the start of the Brymbo and Gatewen branches. 47108 is seen passing through the yard on 27th September 1977, arriving on a 'mainline' service. On reaching the west end of the yard, it will then shunt back into the sidings. A remarkable 39 daily arrivals and departures (excluding light engine movements) made Croes Newydd the busiest freight location in North Wales. The decline here is all too evident, with only 1 'main line' service, a feeder from and to Warrington. Many of the trip workings are marked 'runs as traffic requires', and others may not have run every day. By 1982, Mold was not generating regular traffic, and Brymbo only 2 trains per week.